This protocol includes dissection of murine long bones and bone marrow isolation, to generate bone marrow macrophages and produce osteoclasts using macrophage colony stimulating factor (M-CSF) and receptor activator of nuclear factor Kappa-B ligand (RANKL) or tumor necrosis factor alpha (TNF-α) and their arrest by anti-c-fms antibody, M-CSF receptor. Marahleh, A., Kitaura, H., Ishida, M., Shima, K., Kishikawa, A., Ogawa, S., Shen, W. R., Qi, J., Ohori, F., Noguchi, T., Nara, Y., Mizoguchi, I. Effect of Anti-c-fms Antibody on Osteoclast Formation and Proliferation of Osteoclast Precursor In Vitro. J. Vis. Exp. (145), e59089, doi:10.3791/59089 (2019). Bone remodeling is a complex process and it involves periods of deposition and resorption. Bone resorption is a process by which bone is broken down by osteoclasts in response to different stimuli. Osteoclast precursors differentiate into multinuclear osteoclasts in response to macrophage colony stimulating factor (M-CSF) and receptor activator of nuclear factor Kappa-B ligand (RANKL). Under pathologic conditions, the cytokine profile is different and involves a mixture of inflammatory cytokines. Tumor necrosis factor alpha (TNF-α) is one of the most important cytokines as it is found in large amounts in areas involved with inflammatory osteolysis. The purpose of this protocol is to provide a method by which murine bone marrow is isolated to generate osteoclasts through induction with M-CSF and either RANKL or TNF-α which will be subsequently inhibited by increasing doses of anti-c-fms antibody, the receptor for M-CSF. This experiment highlights the therapeutic value of anti-c-fms antibody in diseases of inflammatory bone resorption. Osteoclasts are highly specialized cells, and they differentiate from hematopoietic stem cells through the fusion of multiple osteoclast precursors. They are essential for healthy bone remodeling and contribute to pathologic bone resorption associated with inflammatory osteolytic diseases such as rheumatoid arthritis and periodontal disease1. Osteoclastogenesis and osteoclast function are mediated by two key factors; macrophage colony stimulating factor (M-CSF) and receptor activator of nuclear factor kappa-B ligand (RANKL). Both M-CSF and RANKL are important for osteoclast differentiation2. Another factor which has been shown to induce osteoclast formation from bone marrow macrophages in vitro is tumor necrosis factor alpha (TNF-α)3,4,5. TNF-α mediated osteoclast formation has been shown to be critical for osteolysis in destructive bone diseases such as rheumatoid arthritis6, periodontal disease7, and postmenopausal osteoporosis8. C-fms is the membrane receptor of M-CSF and mediates its action. The role of c-fms is well documented in the literature as it was demonstrated that the administration of an antibody against c-fms (anti-c-fms antibody) completely arrested osteoclastogenesis in an arthritis model as well as in TNF-α induced bone erosions while osteoclastogenesis distant from the inflamed joint was still robust9. Administration of anti-c-fms antibody inhibited osteoclast formation and bone resorption induced by lipopolysaccharide (LPS) in mouse calvariae10 as well as in LPS-induced periodontitis model11. Moreover, anti-c-fms antibody inhibited mechanical stress-induced root resorption during orthodontic tooth movement12, as well as orthodontic tooth movement and bone resorption associated with orthodontic tooth movement13. M-CSF has been reported to have other functions which are essential to the host immune response. The absence of M-CSF in op/op mice with bacterial pneumonia lead to the increase of bacterial burden and bacterial dissemination to the liver with hepatic necrosis14. Therefore, M-CSF is important for immunological response in the protection from infection. This study demonstrates the effect of anti-c-fms antibody on M-CSF and RANKL or TNF-α induced osteoclast formation in vitro and M-CSF induced proliferation of osteoclast precursors. This protocol demonstrates the isolation of murine bone marrow cells from long bones, and the steps to generate bone marrow macrophages (BMM) which are regarded as osteoclast precursors and to induce the differentiation of BMM into multinuclear osteoclasts by two methods; either RANKL or TNF-α. The protocol also compares the arrest of osteoclastogenesis in both methods using anti-c-fms antibody. The process by which bone marrow is extracted and subsequently used to generate osteoclast precursors is reliable in producing large quantities of pure osteoclast cultures which can be used in multiple downstream applications such as drug testing. The use of either RANKL or TNF-α to induce osteoclastogenesis in this protocol distinguishes osteoclastogenesis as a physiologic process (RANKL) from osteoclastogenesis as a pathologic process (TNF-α), which in turn provides two alternative procedures to guide the decision of which one is superior in terms of the reagents to be used in downstream applications. This protocol also provides a method by which we can determine a suitable concentration of anti-c-fms antibody that can be safely used for later studies involved in bone resorption and osteolytic diseases. All animal procedures and animal care were performed according to Tohoku University rules and regulations. Before dissection, fill a plate with approximately 50 mL of α-MEM depending on the size of the container and place it on ice. This will serve as a collection container until the dissection of all bones is complete. For this and subsequent experiments, use α-MEM containing 10% fetal bovine serum (FBS), 100 IU/mL penicillin G, and 100 μg/mL streptomycin. Euthanize C57Bl/6J mouse by inhalation of an overdose of 5% isoflurane. Fix the mouse in a supine position using pins pierced through the palms and feet and spray thoroughly with 70% ethanol. Make a skin incision using sterile surgical scissors and tweezers at the level of the hip and extend it down to the feet exposing the muscles. Cut the tendon attaching the quadriceps muscle and the tendon attaching the hamstring muscle to the bone. Peel away the muscles exposing both hip and knee joints. Locating these tendons will ease freeing both muscles from their attachments without leaving soft tissue tags. Do not cut into the bone. Position the scissors between the head of the femur and the joint space and cut into it freeing the femur but keeping the bone intact. This will enable detachment of the bones without the risk of exposing the bone marrow. Similarly cut away the muscles attaching to the tibia. Cut the tibia free from its attachment at the ankle joint keeping the bone intact to avoid contamination. Scrape any remaining soft tissue from the femur and tibia using the scissors blades and kimwipe and place it in a plate with α-MEM placed on ice. Fill a 30 G needle syringe with α-MEM. Disconnect the tibia and femur away from the knee joint. Cut the ends of the long bone from both sides using scissors. Hold the bone from the shaft using tweezers, insert the needle into the marrow space of the bone and slowly flush the content of the marrow into a 6 cm culture dish. The bone will appear white, indicating the extraction of all bone marrow content. Repeat for all bones. Strain the bone marrow extract using a 40 μm nylon cell strainer into a 50 mL conical centrifuge tube and centrifuge at 300 x g for 5 min. Discard the supernatant, wash with 5 mL of α-MEM, and centrifuge at 300 x g for 5 min. Repeat wash for a total of 2 times. Make a 1:1 dilution of cell suspension by adding 10 μL of cell suspension to 10 μL of 0.4% trypan blue in a 1.5 mL tube and pipette once. Cover the hemocytometer chamber with a slide cover and transfer the dye suspension to the hemocytometer. It is important not to overfill or underfill the chamber and allow the suspension to fill the chamber by capillary action. Place the hemocytometer on a microscope stage. Using 10x objective, focus on the center square. Count all cells bound by 3 lines. To make sure that cells are not counted twice, count the upper and right corners of each square. Dead cells will appear dark blue, these are excluded from the count. Depending on the downstream application, seed the cells into an appropriate culture vessel. For this particular experiment, follow section 3. Seed 1 x 107 cells/10 mL in a 10 cm culture dish and add M-CSF 100 ng/mL. The final concentration of M-CSF is 100 ng/mL of culture medium. Incubate the culture at 37 °C, 5% CO2 for 3 days. After 3 days, remove the culture medium, wash the cells vigorously with 10 mL of phosphate buffered saline (PBS) twice to remove non-adherent cells, add 5 mL of room temperature 0.02% trypsin-EDTA in PBS and incubate at 37 °C, 5% CO2 for 5 min. Detach the cells by thorough pipetting. Make sure that the cells have been detached by observing the culture under a microscope (the cells should appear rounded and floating in media). If the cells remain attached, repeat pipetting thoroughly to detach them. When the cells have been detached, add 5 mL of α-MEM to inactivate the reaction. Collect the cells into a 50 mL conical tube and centrifuge at 300 x g for 5 min. Discard the supernatant, and wash with 5 mL of α-MEM. Centrifuge at 300 x g for 5 min and resuspend the pellet in 10 mL of α-MEM. Perform a cell count as previously described in step 2.7.1. Seed 1 x 106 cells/10 mL in a 10 cm culture dish and add M-CSF 100 ng/mL. The final concentration of M-CSF is 100 ng/mL of culture medium. Incubate the culture at 37 °C, 5% CO2 for 3 days. After 3 days, harvest the attached cells which represent BMM as osteoclast precursors, follwoing steps 3.2-3.7. Seed BMM at 5 x 104 cells/200 μL of α-MEM in a 96 well plate. Add RANKL for a final concentration of 50 ng/mL or TNF-α for a final concentration of 100 ng/mL. Add M-CSF for a final concentration of 100 ng/mL to each well. Add anti-c-fms antibody (final concentrations of 0, 1, 10, 100, 1000 ng/mL) to each well. Incubate at 37 °C, 5% CO2 for 4 days. Change media every other day for 4 days. After 4 days of incubation, gently aspirate the culture medium of each well. Wash each well once with 200 μL of room temperature 1x PBS. Add 200 μL of 10% formalin to each well for fixation and incubate for 1 h at room temperature. Aspirate the formalin and wash each well 3 times with deionized water. Add 200 μL of 0.2% Triton X-100 in PBS to each well for permeabilization and incubate for 1 h at room temperature. Aspirate the Triton X-100 and wash each well 3 times with deionized water. Add 200 μL of TRAP stain solution to each well. Visualize the stain under the microscope. It will take from 10-30 min for the stain to develop properly. Aspirate the stain and wash each well with deionized water 3 times, and air dry. Keep at room temperature to use in further observation. Seed BMM as osteoclast precursors at 5 x 103 cells/200 μL of α-MEM in a 96 well plate. Add M-CSF for a final concentration of 100 ng/mL to each well. Add anti-c-fms antibody (final concentrations of 0, 1, 10, 100, 1,000 ng/mL) and incubate at 37 °C, 5% CO2 for 3 days without medium change. After 3 days, wash the cells with 1x PBS. Add 100 μL of α-MEM to each well. Add 10 μL of cell counting kit solution and incubate at 37 °C, 5% CO2 for 2 h and determine the absorbance of each well at 450 nm using a microplate reader. The purpose of this protocol is to evaluate the effect of anti-c-fms antibody on osteoclast formation in the presence of RANKL or TNF-α, and to determine the effect of M-CSF on osteoclast precursors proliferation. In this protocol, we have provided a reliable process by which large quantities of pure osteoclast cultures are generated. We have also provided a way to test anti-c-fms antibody suitable concentration for inhibiting osteoclast formation under different culture conditions. The osteoclast formation in M-CSF+RANKL culture with anti-c-fms antibody is shown in Figure 1. At 1, 10 ng/mL anti-c-fms antibody, there was no significant decrease in the number of osteoclasts compared to control (0 ng/mL). While at 100, 1,000 ng anti-c-fms antibody, there was a significant decrease in the number of osteoclasts compared to control. The osteoclast formation in M-CSF+TNF-α culture with anti-c-fms antibody is shown in Figure 2. At 1 ng/mL anti-c-fms antibody, there was no significant decrease in the number of osteoclasts compared to control (0 ng/mL). While at 10, 100, 1,000 ng/mL anti-c-fms antibody, there was a significant decrease in the number of osteoclasts compared to control. Osteoclast precursors culture with M-CSF+anti-c-fms antibody is shown in Figure 3. At 1, 10, 100 ng/mL, there was no significant decrease in the number of osteoclast precursors compared to control (0 ng/mL), while at 1,000 ng/mL, there was a significant decrease in the number of osteoclast precursors compared to control. This indicates that a concentration as high as 1,000 ng/mL is needed to inhibit proliferation of osteoclast precursors significantly. These results provide information about the robust nature of RANKL in producing osteoclasts while a concentration of 50 ng/mL of RANKL was used, and a concentration of 100 ng/mL of TNF-α was needed to obtain the same number of osteoclasts. Both of these methods are suitable for osteoclast generation but the decision of which is superior depends on the downstream application in the context of the reagents to be used later. As the results indicate, using RANKL is not the equivalent of using TNF-α to generate osteoclasts. In this protocol, we used anti-c-fms antibody to inhibit osteoclastogenesis, and by looking at the results, we find that a concentration of 100 ng/mL of anti-c-fms antibody was needed to produce significant decrease in osteoclast number in RANKL wells. A concentration of 1,000 ng/mL of anti-c-fms antibody was needed to inhibit osteoclast precursor proliferation in MCSF proliferation assay, while a concentration of only 10 ng/mL of anti-c-fms antibody was needed to produce significant decrease in osteoclast number in TNF-α wells. Figure 1: Effect of anti-c-fms antibody on RANKL-induced osteoclast formation. Microscopic observation of osteoclast precursors that were treated with M-CSF, RANKL and various dose of anti-c-fms antibody (0, 1, 10, 100 and 1,000 ng/mL) for 4 days. Cells were fixed and stained with TRAP staining. Number of TRAP-positive cells cultured with M-CSF, RANKL and various concentrations of anti-c-fms antibody (0, 1, 10, 100 and 1,000 ng/mL) for 4 days. Cells were fixed and stained with TRAP staining. The number of TRAP-positive cells was assessed. Results were expressed as mean ± S.D. of four cultures. Statistical differences were detected by using Scheffe's tests (n = 4; *p < 0.01). Scale bars = 200 µm. Please click here to view a larger version of this figure. Figure 2: Effect of anti-c-fms antibody on TNF-α-induced osteoclast formation. Microscopic observation of osteoclast precursors that were treated with M-CSF, TNF-α and various dose of anti-c-fms antibody (0, 1, 10, 100 and 1,000 ng/mL) for 4 days. Cells were fixed and stained with TRAP staining. Number of TRAP-positive cells cultured with M-CSF, TNF-α and various concentrations of anti-c-fms antibody (0, 1, 10, 100 and 1,000 ng/mL) for 4 days. Cells were fixed and stained with TRAP staining. The number of TRAP-positive cells was assessed. Results were expressed as meanv ± S.D. of four cultures. Statistical differences were detected by using Scheffe's tests (n = 4; *p < 0.01). Scale bars = 200 µm. Please click here to view a larger version of this figure. Figure 3: Effect of anti-c-fms antibody on proliferation of osteoclast precursor. Cell viability of osteoclast precursors that were treated with M-CSF and various dose of anti-c-fms antibody (0, 1, 10, 100 and 1,000 ng/mL) for 3 days. Cell counting kit-8 was used to measure viability. Data are presented as a percentage to compare the relative activity of the wells containing M-CSF+anti-c-fms versus the wells containing M-CSF alone and expressed as mean ± S.D. of four cultures. Statistical differences were detected by using Scheffe's tests (n = 4; *p < 0.01). Please click here to view a larger version of this figure. In this study, we investigated the effect of anti-c-fms antibody on RANKL-induced osteoclast formation, TNF-α-induced osteoclast formation and M-CSF-induced osteoclast precursor proliferation. We found that the effective amount of anti-c-fms antibody for the inhibition of osteoclastogenesis among RANKL-induced osteoclast formation, TNF-α induced osteoclast formation and M-CSF-induced proliferation of osteoclast precursors is different. RANKL mediates osteoclastogenesis in the presence of M-CSF in vitro, and RANK-null mice experience severe osteopetrosis due to the failure of osteoclasts to develop15, thus RANKL is an obligatory cytokine for osteoclastogenesis and has an important regulatory role in bone homeostasis. Therefore, if RANKL-induced osteoclast formation can be controlled, the decrease in bone mass can be controlled. However, if excessive suppression occurs, bone homeostasis will not be maintained. 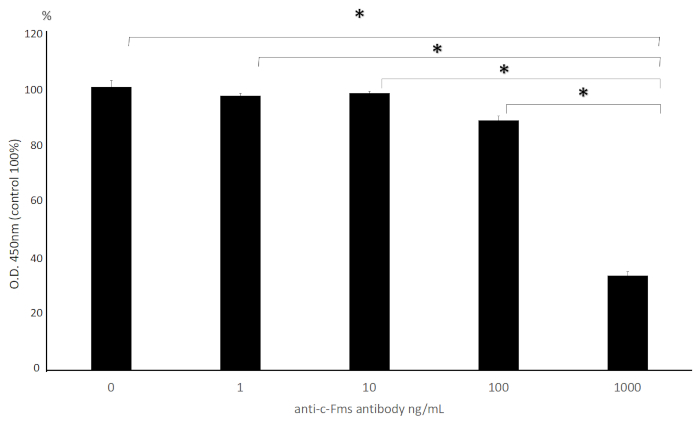 In this experiment, we show that anti-c-fms antibody needs to be at high concentration 100 ng/mL to be able to decrease osteoclast formation induced by RANKL. TNF-α mediated osteoclast formation has been shown to be critical for osteolysis in destructive bone diseases such as rheumatoid arthritis6, periodontal disease7, and postmenopausal osteoporosis8 and here we show that anti-c-fms antibody can easily inhibit osteoclast formation mediated by TNF-α at a low concentration of 10 ng/mL. The result suggests that a low concentration of anti-c-fms antibody could be of therapeutic value to decrease the process of osteoclastogenesis in pathologic conditions but would have minimal effect on osteoclastogenesis in normal conditions. M-CSF is a key factor for osteoclast formation as the op/op mice which lack Csf1 the gene coding for M-CSF show an osteopetrotic phenotype due to complete lack of osteoclasts16. M-CSF also promotes the survival of osteoclast precursors2. M-CSF levels are increased in the serum of patients with rheumatoid arthritis who have severe ankylosing spondylitis17 and in the synovial fluid around loose joint prosthesis18. TNF-α increases the number of osteoclast precursors in vivo as a result of inducing M-CSF gene expression in stromal cells9. In the light of these data we can conclude that M-CSF is an important mediator of inflammation due to the impact of TNF-α on stromal cells which causes an increase in M-CSF production from these cells. It has been reported that M-CSF plays an important role in host immune response such as antimicrobial functions of both lung and liver mononuclear phagocytes during pneumonia14. Therefore, if excessive suppression of M-CSF occurs, there is a possibility that the immune response will decrease. In this experiment, we showed that a very high concentration of anti-c-fms antibody (1,000 ng/mL) was needed to inhibit osteoclast precursors survival and proliferation mediated by M-CSF. These results taken side by side suggest that anti-c-fms antibody may work as a therapeutic to arrest osteoclastogenesis in TNF-α induced osteolytic diseases at low concentration, at the same time this concentration will spare osteoclast formation induced by RANKL and M-CSF which will allow for bone remodeling to occur. Critical steps in the protocol have to be performed carefully to ensure the success of the experiment. In the beginning of the protocol while dissecting, it is important to avoid cutting into the bone to avoid contamination of the bone marrow. In the process of extracting bone marrow, to ensure that all bone marrow have been extracted, the flushing procedure should be repeated per needed until all bone marrow have been extracted, which will provide a high yield of cells. This protocol can be utilized in multiple downstream applications, such as reagent testing, and it also provides a way by which the concentration of anti-c-fms antibody can be tested avoiding false interpretation of the results. As we showed, the concentration of anti-c-fms antibody which was needed to inhibit osteoclast formation is not equal among the methods by which osteoclasts were obtained (RANKL or TNF-α), thus any results obtained with regard to the concentration of anti-c-fms have to be carefully examined in future experiments. This work was supported in part by a JSPS KAKENHI grant from the Japan Society for the Promotion of Science (No. 16K11776 to H. K., No. 17K17306 to K. S., No. 16K20637 to K. K., No. 16K20636 to M. S., No. 18K09862 to I. M.). TNF-α Recombinant murine TNF-α prepared in our laboratory. TNF-α cDNA fragment cloned by RT-PCR and cloned into a pGEX-6P-I (Amersham Biosciences, Piscataway, NJ) to generate a GST-fusion protein. GST-TNF-α was expressed in Escherichia coli BL21 cells cells (Stratagene, La Jolla, CA). The cells were lysed under nondenaturing conditions and GST-TNF-α was purified over a glutathione-Sepharose column. GST was cleaved off by PreScission Protease (Amersham Biosciences) by manufacturer’s directions and was removed by a glutathione-Sepharose column. M-CSF Recombinant human M-CSF. 1/10 vol of CMG14–12 cell line culture supernatant at 5x106 cells in a 10 cm suspension culture dish. Crotti, T. N., Dharmapatni, A. A., Alias, E., Haynes, D. R. Osteoimmunology: Major and Costimulatory Pathway Expression Associated with Chronic Inflammatory Induced Bone Loss. Journal of Immunology Research. 2015, 281287 (2015). Teitelbaum, S. L. Bone resorption by osteoclasts. Science. 289, (5484), 1504-1508 (2000). Azuma, Y., Kaji, K., Katogi, R., Takeshita, S., Kudo, A. Tumor necrosis factor-alpha induces differentiation of and bone resorption by osteoclasts. Journal of Biological Chemistry. 275, (7), 4858-4864 (2000). Kobayashi, K., et al. Tumor necrosis factor alpha stimulates osteoclast differentiation by a mechanism independent of the ODF/RANKL-RANK interaction. Journal of Experimental Medicine. 191, (2), 275-286 (2000). Kim, N., et al. Osteoclast differentiation independent of the TRANCE-RANK-TRAF6 axis. Journal of Experimental Medicine. 202, (5), 589-595 (2005). Redlich, K., et al. Osteoclasts are essential for TNF-alpha-mediated joint destruction. Journal of Clinical Investestigation. 110, (10), 1419-1427 (2002). Abu-Amer, Y., Ross, F. P., Edwards, J., Teitelbaum, S. L. Lipopolysaccharide-stimulated osteoclastogenesis is mediated by tumor necrosis factor via its P55 receptor. Journal of Clinical Investestigation. 100, (6), 1557-1565 (1997). Zha, L., et al. TNF-alpha contributes to postmenopausal osteoporosis by synergistically promoting RANKL-induced osteoclast formation. Biomedicine & Pharmacotherapy. 102, 369-374 (2018). Kitaura, H., et al. M-CSF mediates TNF-induced inflammatory osteolysis. Journal of Clinical Investigation. 115, (12), 3418-3427 (2005). Kimura, K., Kitaura, H., Fujii, T., Hakami, Z. W., Takano-Yamamoto, T. Anti-c-Fms antibody inhibits lipopolysaccharide-induced osteoclastogenesis in vivo. FEMS Immunology and Medical Microbiology. 64, (2), 219-227 (2012). Kimura, K., et al. An anti-c-Fms antibody inhibits osteoclastogenesis in a mouse periodontitis model. Oral Diseases. 20, (3), 319-324 (2014). Kitaura, H., et al. An M-CSF receptor c-Fms antibody inhibits mechanical stress-induced root resorption during orthodontic tooth movement in mice. Angle Orthodontist. 79, (5), 835-841 (2009). Kitaura, H., et al. An anti-c-Fms antibody inhibits orthodontic tooth movement. Journal of Dental Research. 87, (4), 396-400 (2008). Bettina, A., et al. M-CSF Mediates Host Defense during Bacterial Pneumonia by Promoting the Survival of Lung and Liver Mononuclear Phagocytes. Journal of Immunology. 196, (12), 5047-5055 (2016). Dougall, W. C., et al. RANK is essential for osteoclast and lymph node development. Genes & Develpoment. 13, (18), 2412-2424 (1999). Wiktor-Jedrzejczak, W., et al. Total absence of colony-stimulating factor 1 in the macrophage-deficient osteopetrotic (op/op) mouse. Proceedings of the National Academy of Sciences of the United States of America. 87, (12), 4828-4832 (1990). Yang, P. T., et al. Increased expression of macrophage colony-stimulating factor in ankylosing spondylitis and rheumatoid arthritis. Annals of the Rheumatic Diseases. 65, (12), 1671-1672 (2006). Takei, I., et al. High macrophage-colony stimulating factor levels in synovial fluid of loose artificial hip joints. The Journal of Rheumatology. 27, (4), 894-899 (2000).